Although Deer Lake is not as productive as other nearby stocked trout lakes in the Lower Mainland, it is still an excellent option for those who wish to do a short fishing outing without travelling too far. Deer Lake Park is a peaceful refuge for residents in Metro Vancouver where fishing, trail walking, photography, canoing are available. Beside trout fishing, anglers also have the option of targeting carp. 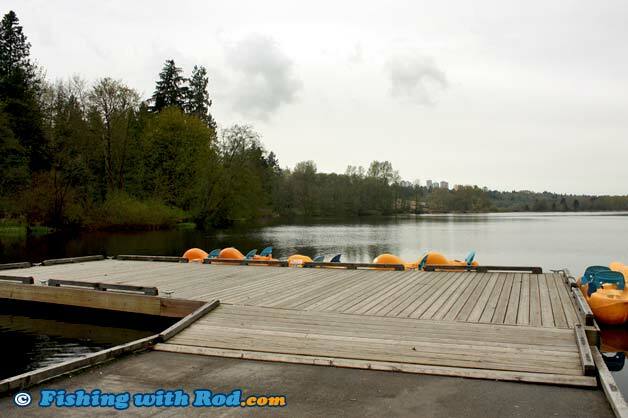 The best access point of Deer Lake is the boat launch/rental on the east side of the lake, where you can park your car. From the parking lot, you can either fish at the floating dock or beach, or walk along the north or south side of the lake to other fishing spots. To reach the east side of the lake, turn onto Sperling Avenue from Canada Way. Deer Lake is stocked between March and May, October and November with rainbow trout by the Fraser Valley Trout Hatchery. These trout are usually around 300g when they are released. The lake also has resident trout that can get quite big, but they are rare. Fishing for trout is best in spring and fall at Deer Lake. The water is often too warm between June and September. Deer Lake also has an established population of common carp. Carp fishing is best between spring and fall. Fishing generally slows down in May and June, when spawning takes place. Powered boats are prohibited at Deer Lake so if you decide to use a boat, then you have to row. It is not a very big lake, so a small row boat or even a float tube is very suitable for this fishery. A boat allows you to get away from the shallow parts of the lake and concentrate your effort near the middle. Flyfishing is usually the most productive method when fishing from the boat, but you can certainly troll a lure too. Shore fishing is slightly more difficult when targeting trout, because the waters near shore are mostly shallow and covered with weeds during the warm months. To get your bait out without tangling with weed, float fishing is the best method. If you prefer to fish with a bottom rig, then the floating dock on the east side of the lake maybe your best option. If you are interested in targeting carp at Deer Lake, then corn, dough balls are the best bait. It is important to keep your bait stationary, so a bottom rig is required. If you are float fishing, adjust your float so the bait is resting on the bottom. Carp in this lake are quite large, so be sure to use tackle that is strong enough for these golden beasts. Deer Lake is located in Region 2 in the British Columbia freshwater fishing regulations.